Alobates pensylvanica (False Mealworm Beetle). Size: approx. 20 mm. Photo: 04/12/16, 9 pm. 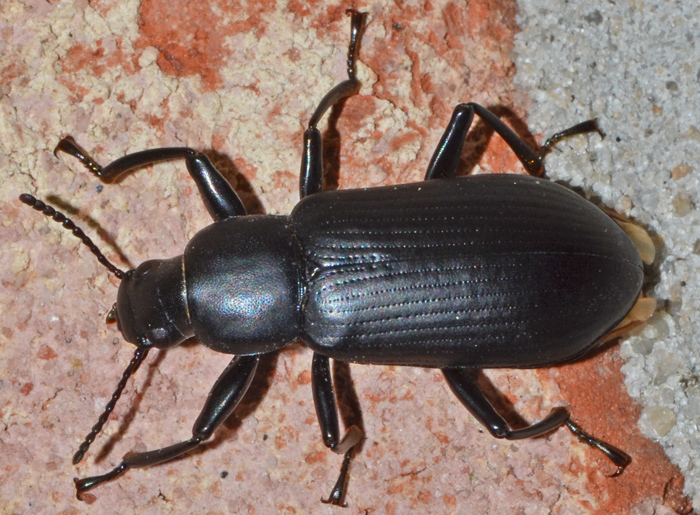 Usually found under decaying bark in forests, the predatory False Mealworm Beetle is also attracted to lights at night. Its pronotum is almost square and the elytra have rows of fine punctures. The sister species A. morio is very similar, but rarer and has a tuft of yellow hair on the mouthparts. The species name is sometimes spelled "pennsylvanica".